There is no feeling that compares with having a child, seeing that precious baby for the first time and eagerly anticipating all the time you will be spending together. When I had my children, it was indescribable. I wanted them with me all the time, everywhere I went. But I couldn’t carry them for long periods without help because I had a Cesarean section when I had them. There were two things that helped me out and which I recommend for any mommy or daddy when carrying your child. I used a baby sling when my children were newborns until they could sit easily on their own. This made it so much easier for me to carry them because I didn’t have to use my core to carry the weight. Even a 6lb. baby is heavy when you’ve just had a C-section! My baby never fussed because he felt like it was just me holding him. He was never aware of the fact that the sling was doing more than half of the carrying work. The sling also helped keep me private when I was breastfeeding. From a vain perspective, a baby sling was also great in terms of style. Becuase it looks like a long shawl and it comes in so many different designs, I was able to carry my baby around comfortably with some style. Daddy’s can use the baby sling as well. It is very easy to use and is adjustable so anyone can use it. It helps give Dad’s who are not as confident yet with carrying their child on their own, that additional support. This gave my husband the opportunity to carry our child around a lot. He told me that he felt more comfortable carrying our son with a little help from the baby sling. He was able to focus on our baby and not on whether he was carrying him the wrong way. One really good thing as well was that the baby sling was not very expensive. I chose to use the baby sling until my son was arougnd 8 months old. 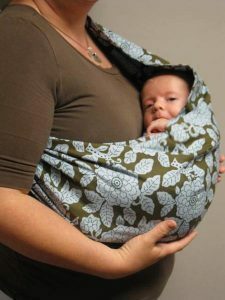 You can use it for longer as long as your child still satys withing the recommended weight that the sling can handle. But I prefered the baby backpack carrier at this time. By this time I was up and about again and I was trying to get back into shape and lose the baby weight. The backpack carrier just made it really easy for me to take my son on long walks around the park with me. It had durable and adjustable straps, a lot of comfortable cushioning so he wasn’t squeezed in too tight, pinched uncomfortably anywhere, or unsafely belted in. I made sure the backpack carrier I got was ergo-checked as well so I was assured I wasn’t doing damage to me or my baby in using it. It cost more than the baby sling but I was able to set aside something for this by this time. The question now is, what is the best baby carrier? 1. Know what you want and need for yourself and for your child when taking care of your precious baby. 2. Research. Look at reviews and testimonials from other parents who have used baby carriers. Ask the opinion of your friends who are parents. Look at manufactures ratings as well. Look at the baby carriers you are eyeing and see what materials they are made of and if these are durable and safe. 3. Remember that there is no hard and fast rule except that you keep yourself and your child comfortable and safe. So, good luck with the purchase. Have fun with it and enjoy every moment carrying your child! How did you carry your baby around? What would you do differently next time?